We have had some beekeepers calling in asking what is wrong with their queens. They find multiple eggs in the cells and the eggs found in the cells are not centralized. There is no visible queen and the capped brood they find is nothing but drone. These are the sure signs of a laying worker. 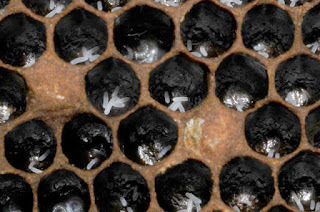 If a hive becomes queenless for several weeks, a worker can take it upon herself to begin laying eggs. It is the lack of brood that begins this process and because the worker has not mated with drones, the eggs are infertile (they develop into drone brood). This is a frustrating problem because it is hard (near if not completely impossible) to go into the hive, find her, and remove her. She will appear as any other worker. A new queen must be introduced in order for the colony to survive but couldn't the colony kill off the new queen? Yes, because the colony could kill off a new queen, we recommend two different methods to get your hive queen right. These methods are not full proof but will give your hive a fighting chance. First: In theory, the laying worker will be heavier due to the fact she is now laying eggs. Move your hive away from its original location (100 yards) and take each frame out, shake off all the bees and return frames into the hive. Do this for each frame until all frames are clear of bees. Return the hive back to its original location. Because the bees are oriented to the original location, they will return to the hive. The laying worker being heavier, she will not be able to return to the hive. Second: Slowly introduce frames of open brood into the hive. By the third or fourth frame of open brood, your colony will begin rearing a new queen. They will sense the poor/improper production of the laying worker and will want to replace her with a new queen. This method does take more time and more trips to the bee yard. In order for the colony to increase the population, it must be queen right. There are many threats that can kill off a queen so be mindful and careful as you inspect your hives. Check for eggs and the brood pattern. If everything appears to be in order, you should be certain your hive is queen right.